The 2020 Cadillac CT5 finally showed off earlier this month ahead of a proper debut at the 2019 New York International Auto Show, though we were only treated to two views. One was the Premium Luxury trim, while the other was the Sport trim. Only silver and a dark burgundy hue were shown. Now, we know what the 2020 Cadillac CT5 will potentially look like in a wide array of colors. The CT5 Forum has published photos of the sedan in several other colors, ranging from staple blacks and grays to blues, reds, and even green. What the colors show is how well the CT5’s new style translates to different colors. While the sedan looks somewhat understated in its silver and dark red colors shown in official photos, the photoshops of the red, blue, and green hues really accentuate the car’s lines. The more vibrant colors cast the CT5 in more of a sporting light, while the bronze, pearl white, slate blue, and a flat black underscore more luxurious undertones. We don’t know what colors Cadillac plans to offer for the sedan, but hopefully, some of these more colorful choices make their way to production. As for the CT5 itself, it replaces both the ATS and CTS sedans. It straddles segments somewhat to directly take on the compact sedan segment, or D-segment, which includes cars like the BMW 3-Series, Mercedes-Benz C-Class, and others. We know the car will feature either a 2.0-liter turbocharged four-cylinder engine or a 3.0-liter twin-turbo V6. It’s all but certain that rear-wheel drive will be standard, while all-wheel drive will be optional. Following the CT5, we’ll see the smaller CT4 make its debut later this year. The CT4 will place Cadillac in the sub-compact sedan segment to rival cars like the Mercedes-Benz A-Class and CLA-Class or Audi A3. Let me guess, “Chartreuse” will be the only standard color and anything else is “extra cost”. White, black, blue are extra but some fugly clown color no one really wants is your only std choice? Oh and your interior choices, “Jet Black” (they use “jet” to make it “sound” special except its the same interior as a Sonic). I don’t blame Cadillac I blame the cheap [email protected]$$tards at GM. I mean GM provides so much value for the money paying extra for “paint” should be a no brainer for the consumer…. “any color as long as its black” nearly cost Henry Ford his company. GM needs to quit being such a D/B company and give terrific value for the money, they provide zero. Until they take care of their customers vs giving 75% for top dollar I’ll never buy anything from this company. If Miss Mary has her way, she will cut colors, jack up the price past the competition with a inferior vehicle…Then sales will fall and heavy discounts will be applied in a desperate attempt to stem the bleeding. That doesn’t work so she will just fire her workers and blame everyone else for her failings. Couldn’t have said it better. People like her work and live in a vacuum where no world exists outside of the walls of the RenCen, so they are never exposed to anyone who questions their narrow, delusional thinking. Then don’t buy anything y this company….. I won’t be buying anything more from GM. Not until Mary is gone and things are fixed. Sorry, but after 3 new and 2 used GM vehicles I am pretty much done with this mess. Why do you have to be so dramatic and over the top about color choices. You just sound like some type of hater. Not a big fan of the plastic window or the little line thing behind the window in the C pillar section. Can’t say tha I am crazy about the tweeter direction that Cadillac is going. It worked before and if had stayed with it I would be ok with it. Bu now that they try tried to compete size wise and failed it seems like the are saying we can’t comprye head to head so we are giving up.In my open which don’t count for much Cadillac should hav stayed in the same class and made the much need improvements. Their vechles should have offered just a little more for quiet a bit less. Whatever the competition interior measurements were just add an inch. Trunk add a foot. Gas tank add a gallon. HP add a few horses and ect. I’m sure all of those colors shown except refrigerator white will be extra cost to pad Mary’s pockets for her triple zero future pet project. Then the following year they will reduce the exterior colors down to 20 shades of grey, one red, a few black colors and of course the expected white. The interior will lose both rear seat map pockets, the glove box will lose it’s light, the rear doors will lose there buttons and zero advanced safety equipment will be offered unless you go for the Ultra Platinum Premium Exquisite Plus model for 75K where it will be an additional 3500 bucks for crap you don’t want. Ditto the 3.0 TT. Joe knows. Couldn’t have said it better myself. Really is sad what GM has come to under Mary Barra. Stock price doesn’t lie…Sales numbers don’t lie no matter how much you try to spin them…rebates on brand new 2019 models that are supposed to be your bread and butter cash cows (think Silverado). Meanwhile Mary is doing photo ops and talking a lot of hot air. Guess that keeps you away from doing the hard work like fixing the mess your company is in right now! OK, I have been a Cadillac owner most of my adult life, currently sitting in a ’17 CTS. There is NO WAY IN HELL I will by a car that has that TACKY design in the far back pillar (C), it makes the entire car look like some cheap piece of shyte. What a cowardly design. This is a failined Infiniti design that they would not have taken. Have some balls Cadillac, that is what made you. If you are going to fail, then fail GREATLY as the stupid tag line was – not this inoffensive Mary Bara Crap. Since this was on Johans watch as well – he stunk as well. It looks like Cadillac’s version of the Honda Accord. Uninspired. 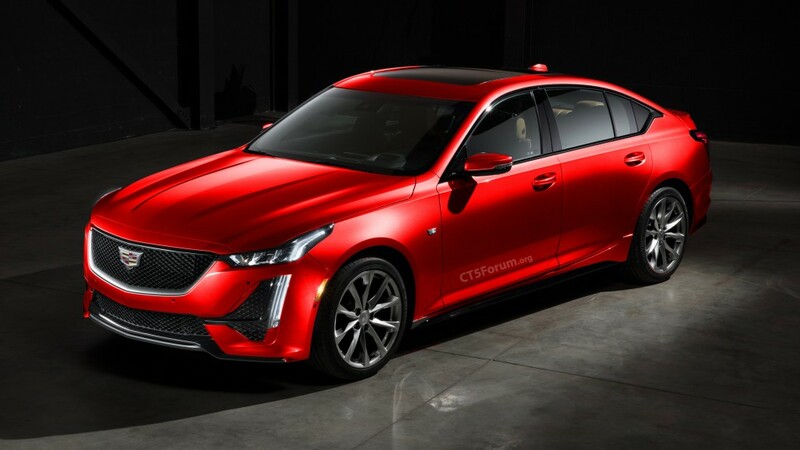 I like the 2019 Cadillac CTS design better. This CT5 is supposed to replace that car right? LED strip should connect and extend further down the front for a more dramatic and powerful look. Headlight units should be jewel eye or at least projectors like on the XT6 (jewel eye would allow for smaller units). Rear window plastic should be glass, C pillar should be taken right from Escala. Caddy’s designers are so close to making a truly beautiful car but fall short on simple things. That or the bean counters are trying real hard to justify their jobs. Either way, good looking car that could be made a lot better with small changes. I’m just not feeling that Accord/Altima-ish C pillar design. The rest of the car I like so far other than that. However, I can say that I’ve noticed the Sport (with black trim) makes it stand out (worse) more than the Luxury chrome does. Not sure why, but the chrome must break up the ugly a little more. Also thought it looks best in that dark maroon color they first showed it in. Just my opinion. “I’m not going to buy a car because of the C-pillar.” Yeah sounds ridiculous when you say it. Were they suppose to put a tiny useless piece of glass there? That would say old man car to me, what they put looks sleeker/modern. I was excited waiting for the CT5 to come out to trade my 17 ATS Premium Luxury AWD 3.6 until I seen the only engine options.No way I am having a 4 cylinder in a Cadillac which requires premium fuel nor do I want a 6 cylinder twin turbo requiring premium fuel.Since taking possession of my 17 ATS I have saved close to $1700.00 in price difference between regular and premium fuel.I remember G.M. stating the new 3.6 engine was their main stay engine but does not seem to be. The current 3.6 LGX V6 is a good engine. I drove a current style Camaro and two rental CT6 AWD sedans. The 3.0TT was disappointing. It only revs up to 6K RPM’s, is noisier than the 3.6, recommends premium fuel and doesn’t seem much faster than the 3.6. The 3.6 CT6 was quieter, revved out to 7K, runs fine on 87 octane, is cheaper to purchase and feels plenty quick enough in it’s 335 HP versions. But it’s not considered cool because turbos somehow equate to being better so this is why they have to start phasing it out. Like some have already mentioned, I am on my 6th Cadillac (2017 CTS V) – however this will be my last. At best, this is a completely uninspiring design. At worst it is hideous. Don’t know why GM just didn’t use the Escalator concept car design. It received many great reviews. Some GM folks are saying that it contains Escalate styling cues. Oh, really?!? I think they wasted a good concept car. What a shame. Don’t know why GM just didn’t use the Escala concept car design. It received many great reviews. Some GM folks are saying that it contains Escalate styling cues. Oh, really?!? I do not like Ford. But their management is going to eat GM for breakfast. at Cadillac – hell, even at GM? Does Mary Bara know what a car actually is? Worst Cadillac design in 30 years. Looks like the offspring of Hyundai, Infinity and an old Cruze. Cadillac will never challenge Benz or even Audi. The 90’s Deville and Seville look way better than this Asian cookie cutter thing! At least you can easily identify those 90’s cars. The Catera was an Opel with a Cadillac badge and grille so I hardly would count that. This is probably the ugliest thing I’ve ever seen out of GM design. It is BEYOND shameful. I’m no Hyundai fan, but they’ve never made something this straight up U G L Y. This thing looks like some the awful crap the Chinese start ups have designed. This car doesn’t have the style or the presence to be a Cadillac. If this is the best GM can do for Cadillac ten years after the humiliation of bankruptcy, then the most searching questions have to be asked of management and design, starting with Ms. Barra. Either that, or just throw in the towel and let a resurgent Lincoln carry the standard for American luxury.